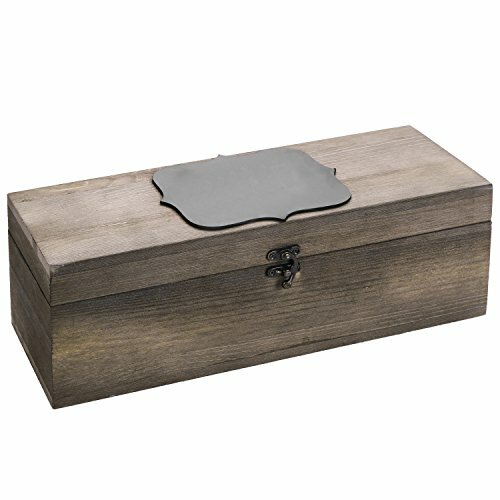 Providing a unique way to present a gift of wine, this rustic wooden wine box is perfect for sharing favorite bottles with fellow aficionados. Made with burnt wood for a convincing worn vintage look, this wine case features a swing clasp for a secure closure and added antique appeal. A chalkboard label allows personalized messages to be written and adds to the reusable convenience. Also suitable for use as a decorative piece, this stylish wine box makes a great accent for any wine-drinking setting. Marking a serious appreciation for fine wine, this wine bottle carrier is an essential accessory for every connoisseur. RUSTIC WOODEN WINE BOX: A wine bottle carrying box with burnt-wood finish and chalkboard label. VINTAGE-STYLE DESIGN: Distressed-look finish and swivel latch clasp closure create a convincing antique look. DECORATIVE GIFT BOX: Makes a perfect presentation for a gift of a bottle of fine wine or champagne.